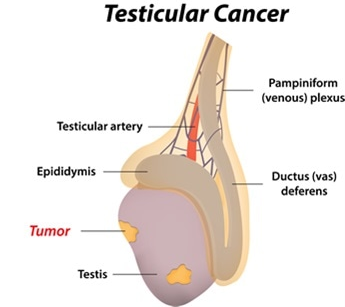 Testicular cancer is cancer that develops in the testicles, which are part of a man's reproductive system. Testicular cancer is rare with only around 2400 men in the UK diagnosed each year. The testicles are made up of different types of cells and the type of cancer is dependent on the type of cell the cancer starts in. There are 2 main types of testicular cancer; seminoma and non-seminoma and these both develop from germ cells in the testicles. About half of all testicular cancers are pure seminomas. Non-seminomas include teratoma, embyronal carcinoma, choriocarcinoma and yolk sac tumours. Other rare types of testicular cancer include lymphoma and mesothellioma but these are extremely rare with only a few men diagnosed in the UK each year. Surgery is the first treatment for testicular cancer but after surgery they might have one of the following or a combination of these; monitoring, chemotherapy and radiotherapy. Treatment is dependent on stage of cancer. Survival for testicular cancer is very high and nearly all men are cured. In England and Wales almost all men will survive their cancer for 1 year or more after they are diagnosed and 98% will survive their cancer for 5 years or more after diagnosis. It is rare for testicular cancer to come back more than 5 years later and therefore the 5 and 10 year survival figures are virtually the same. The table below lists the current open trials for testicular cancer coordinated by the Cambridge Cancer Trials Centre (last updated February 2018).